Insomnia Prevents the Pok�mon from falling asleep. This Pokemon cannot become Asleep. Frisk The Pokémon can check the foe's held item. This Pokemon can see what enemy Pokemon are holding. Cursed Body* Moves that hit this Pok�mon have a 30% chance of being Disabled afterward. 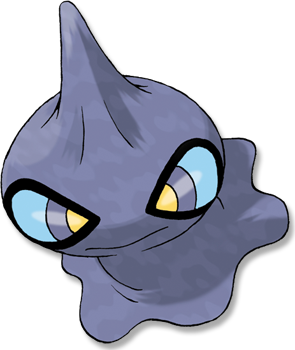 Ruby/Sapphire SHUPPET grows by feeding on dark emotions, such as vengefulness and envy, in the hearts of people. Emerald This POK�MON roams about deep in the night seeking such negative emotions as grudges and envy. It retreats to its nest when the sun begins to rise. Leaf Green It loves to feed on feelings like envy and malice. Its upright horn catches the emotions of people. Diamond/Pearl It loves vengeful emotions and hangs in rows under the eaves of houses where vengeful people live. Platinum It loves vengeful emotions and hangs in rows under the eaves of houses where vengeful people live. Heart Gold It uses its horn to feed on envy and malice, or so it�s said. It�s very active at night. Soul Silver It uses its horn to feed on envy and malice, or so it�s said. It�s very active at night. Black It loves vengeful emotions and hangs in rows under the eaves of houses where vengeful people live. White It loves vengeful emotions and hangs in rows under the eaves of houses where vengeful people live.